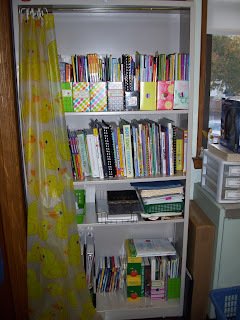 This is a bookshelf I got from Freecycle.org (have you tried it yet? It's amazing!) that I painted. 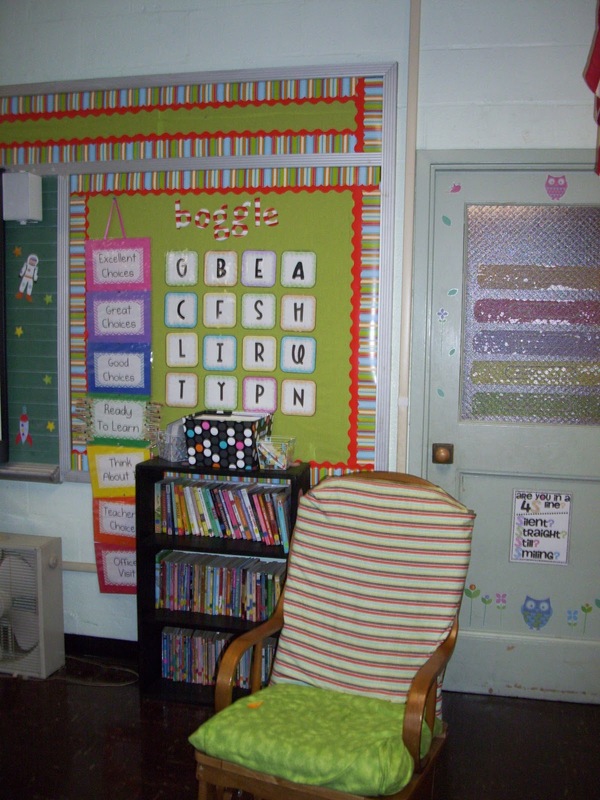 I have my character rocks bulletin board and bucket filling resting on top of the shelf. I got the idea for character rocks from http://www.rundesroom.com. Check out her blog...it's amazing. On the shelf of the board you can see my art museum for all the beautiful works of art that we receive from our students. This is my must do, may do board. 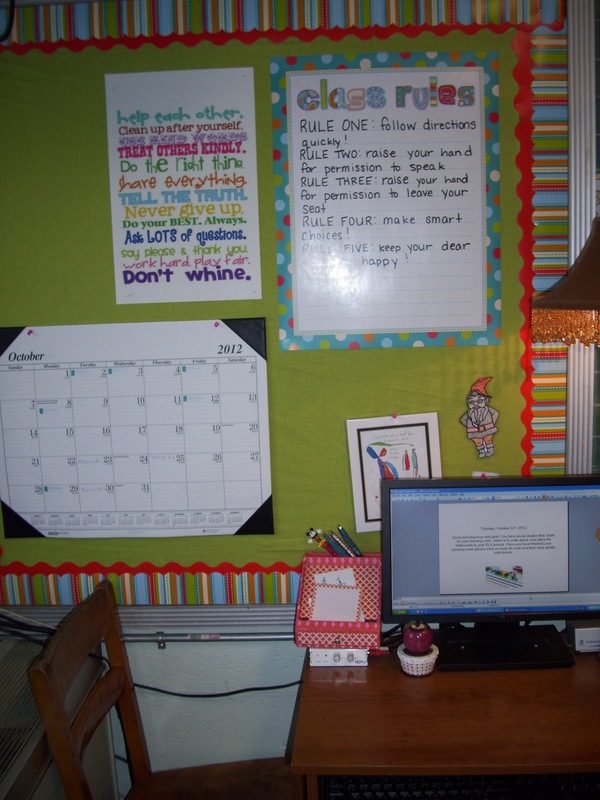 I write the assignments that must be completed by the end of the day and those fast finishers can work on the may do's. Next to it is the word nerd wall. 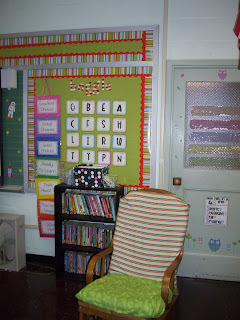 It's an interactive bulletin board that you can get at TPT from another teacher here: http://www.teacherspayteachers.com/Product/Word-Nerd-Wall. Fun fact that lamp and bookshelf that it rests on are also from Freecycle! Here is my Boggle board and clip chart. I got my Boggle board here: http://www.teacherspayteachers.com/Product/Boggle-Daily-5-Word-Work and the typed steps of the clip chart here: http://www.teacherspayteachers.com/Product/Classroom-Management-Clip-Chart-Kid-Handwriting. 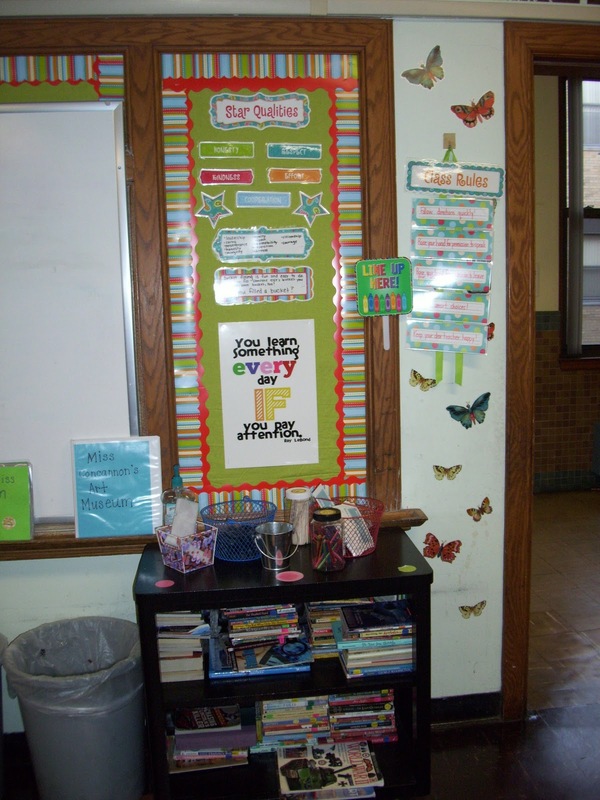 The kids love the clip chart and want to get to excellent choices. I also got some things from Vistaprint (another favorite website of mine) to send home to the parents letting them know their child clipped up to excellent choices, punch cards for prizes, and cute magnets. I need to note that this bookshelf and the chair also came from Freecycle (did I mention how much I love that site?)! On this board you see my class rules (I use Whole Brain Teaching and love it! ), a cute poster I uploaded to Vistaprint from http://www.technologyrocksseriously.com (the poster from the first picture also comes from her site). She has tons of free printables that are super adorable. I use my desk calendar for the kids to keep track of long term assignments and special events...it's better than it being buried under paper on my desk! I teach science so I need to represent! 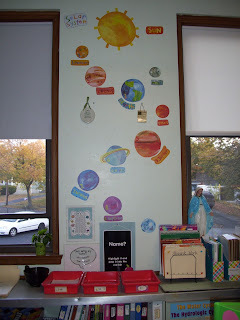 I put up these adorable solar system stickers last year and I love them! 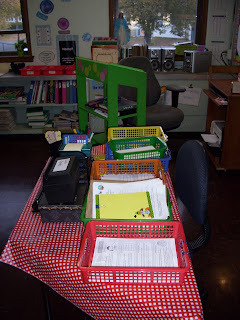 Below are the bins where my three classes turn in their finished work. I have them highlight their names...no name papers are a pet peeve of mine! This is next to my computer, which is why you see the wire rack with teacher's editions and absent work folders. 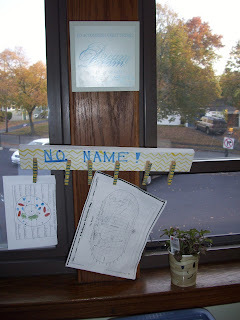 Found this on Pinterest for those pesky no name papers! This is my professional bookshelf in the back of the classroom. I have my books categorized and labeled of course! 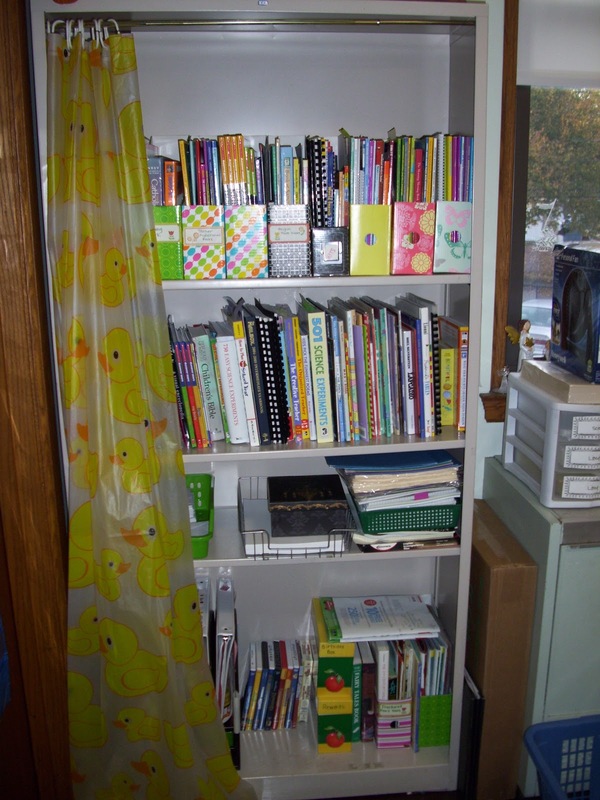 I also store DVDs, Scholastic catalogs, envelopes, and papers here. The best part is the rubber duck shower curtain so I can hide it all. 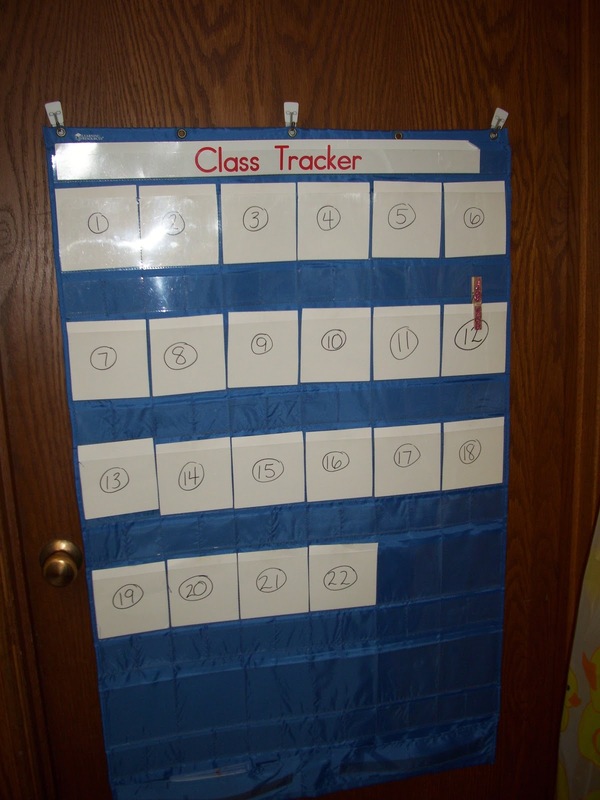 I got the Class Tracker off of Reallygoodstuff.com a few years back and love it. I take a picture of the students the first day of school and post it to the front of these cards. 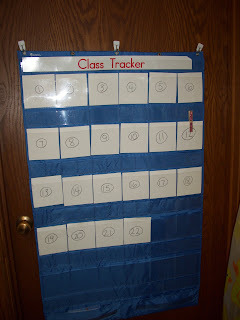 The back is numbered so that they can easily find themselves in the morning and turn it over to show that they are present. I have an attendance checker who takes care of this, tells me who is absent, and flips the cards back over at the end of the day. The glitter clip changes daily and that person is the leader and gets to draw the smiley faces on the scoreboard (from Whole Brain Teaching). And last but not least...my teacher toolbox! I found this on Pinterest, which links to http://mrsrojasteaches.blogspot.com/2011/08/teacher-toolbox-and-b2s-freebie.html. It was super easy to make and it oh so useful!